Emma's felt, hula hoops & jewelry. All handmade in Ireland! 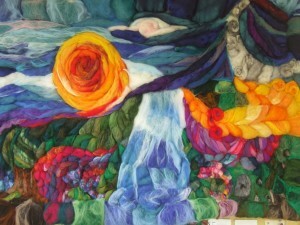 Large needle felted wall hanging. Bartered for two garden gates, now living in Tipperary. Artist, Emma Allott crafts unique sculptures and reliefs from pure wool, created using the intricate needle-felting technique. These beautiful and imaginative pieces are designed and entirely hand-crafted at her home studio near Cahir, Co. Tipperary, Ireland. Her inspiration is drawn from the surrounding coutryside and stories from her childhood. The influence of traditional fairtale illustrators Arthur Rackham, Edmond Dulac, Harry Clarke, Mable Lucie Attwell, Kay Nielson and their contemporaries is seen throughout her work. Combining strong colours and textures, her pieces reflect the depth and warmth of a cottage garden, hinting at its natural mystery. 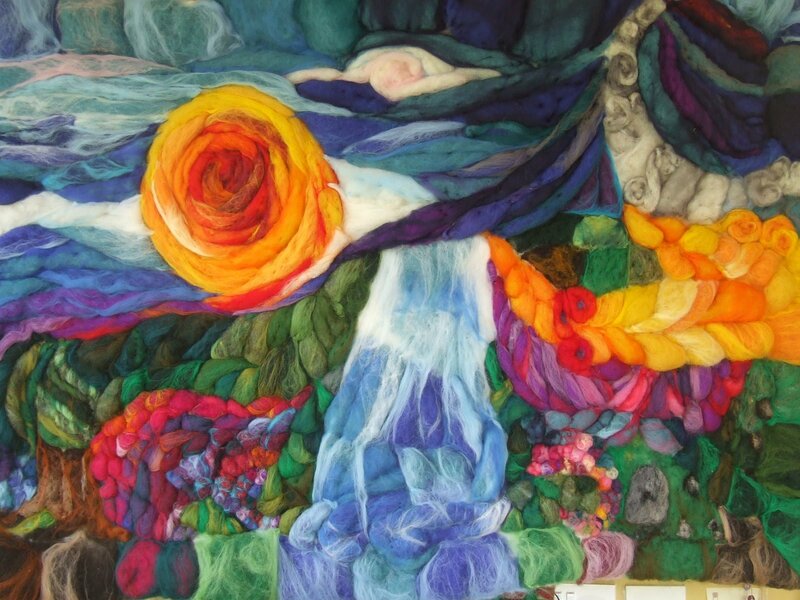 Each picture starts with the making of a background using traditional felting methods. The detail, colour and texture are applied using a felting needle to attach the wool directly on to the felt background. Sculptural pieces are also made entirely from wool, intensively worked to form a firm and well-defined character. As well as pictorial work, Emma makes a rage of felt pieces for the home, including cushions, table mats, egg and tea cosies as well as cat beds and mats. Emma also makes hats, bags and hair adornments, all from wool which she felts by hand. New to this collection, Emma has started making adult hula hoops. Emma's Felt Works © 2019. All Rights Reserved.